We are still on our healthy eating kick with only a few slight setbacks while on holiday (hello tasty beer and some gluten-centric treats), we could maybe even stop calling it a ‘kick’ as it is becoming an excellent lifestyle, Ben continues to say ‘he has never felt better’. It has forced us to think of our meals as one, two and three in lieu of the traditional three. 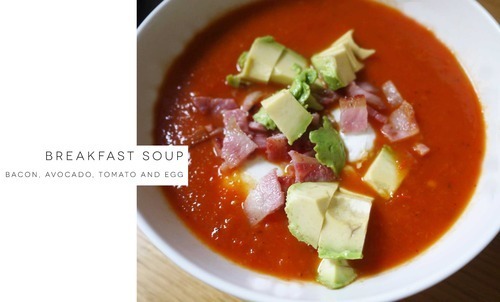 This makes it easier when you are facing a bowl of breakfast soup. Which is what we have been eating recently. This version of roasted red pepper and tomato is perfect hot or cold. We had it hot- the first morning and added poached eggs, some avocado and meat garnish for Ben- in this case bacon and it keeps you going (almost) as long as a hearty bowl of oatmeal. Loads of other cultures favor soup for breakfast. In Turkey they have a lentil-based variety with tomatoes and bulgar called ezogelin çorbası. Mexicans favour soup, which shares the name with a famous Puetro Rican boy band- Menudo. The liquid version is concocted using tripe and hominy and served with fresh-made tortillas. I must admit- tripe scares me, but if you are feeling brave- here is a recipe. I might have to give chagua a try when I am in Colombia this fall. This breakfast treat consists of a freshly poached egg in a milky broth, flavored with coriander (cilantro) and onions. In Japan, miso soup is also an important part of the first meal of the day, not just the way we sample it in the west- pre-sushi. Although it is tasty then too! I was not brave enough to give congee a whirl when I spotted it in the breakfast buffet during my past trips to China, but now doing some research, I am not sure what put me off, it is a rice porridge, usually had savory. I think it was some of the strange-to-me looking condiments which were used to flavour this breakfast staple which might have put me off. I think breakfast soup is the way of the future at least here at our place.